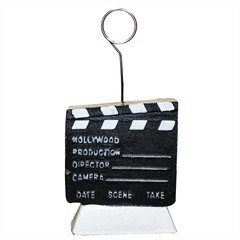 Set the scene for your Hollywood centerpiece with our 3" clapboard balloon weight. Our clapboard balloon weights can also be used to hold a photo, a place card or a table number as it adds to the table decorations for your movie night party or becomes a take home favor. The clapboard balloon weight is sold by the piece. Balloon weight is 6.5 ounces. Please order in increments of 1 piece.